Streaming video provider Vudu announced that a breakin March 24th resulted in the theft of hard drives containing customer information, including names, email addresses, postal addresses, phone numbers, account activity, dates of birth and the last four digits of some credit card numbers. 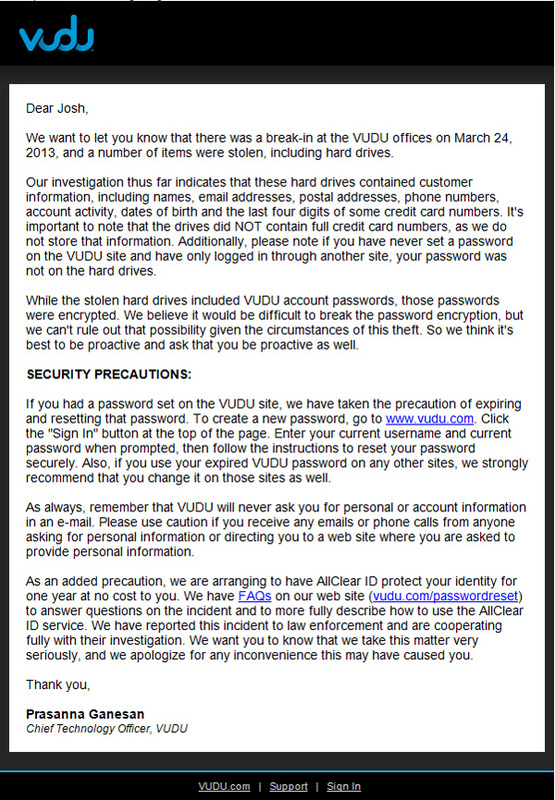 According to Vudu, full credit card numbers were not stolen and that user passwords were encrypted. However, Vudu provided no details on the type of encryption used and whether it could be easily broken. A statement from Vudu was not encouraging, "We believe it would be difficult to break the password encryption, but we can't rule out that possibility given the circumstances of this theft." Therefore, all Vudu users should immediately change their passwords on any other sites on that use the same password as your Vudu account. Also, because emails addresses and other personal information were stolen, Vudu customers should be extremely cautious of phishing emails requesting passwords or other personal or financial information. To help assist with future problems related to the data theft, Vudu has arranged for all customers to receive one year of identity protection services from AllClearID. Enrollment is not required. AllClear services can be accessed, if needed, from your Account Information page on the Vudu site.